WASHINGTON -- Defense Secretary Jim Mattis declared Monday that he was "shocked" upon his return to the Pentagon by the poor state of the U.S. military's readiness for combat. He put most of the blame on Congress for its inability to approve budgets on time or repeal a law that strictly limits defense spending. Testifying before the House Armed Services Committee, Mattis said Congress has "sidelined itself from its active constitutional oversight role" by failing to deliver a steady stream of funding to pay for new weapons and other critical gear. "It has blocked new programs, prevented service growth, stalled industry initiative and placed troops at greater risk," Mattis said as he urged the panel to do away with the Budget Control Act of 2011. If the budget caps mandated by the law are breached, automatic spending reductions known as sequestration are triggered. "For all the heartache caused by the loss of our troops during these wars, no enemy in the field has done more to harm the readiness of our military than sequestration," said Mattis, who retired from military service in 2013 as a four-star general. 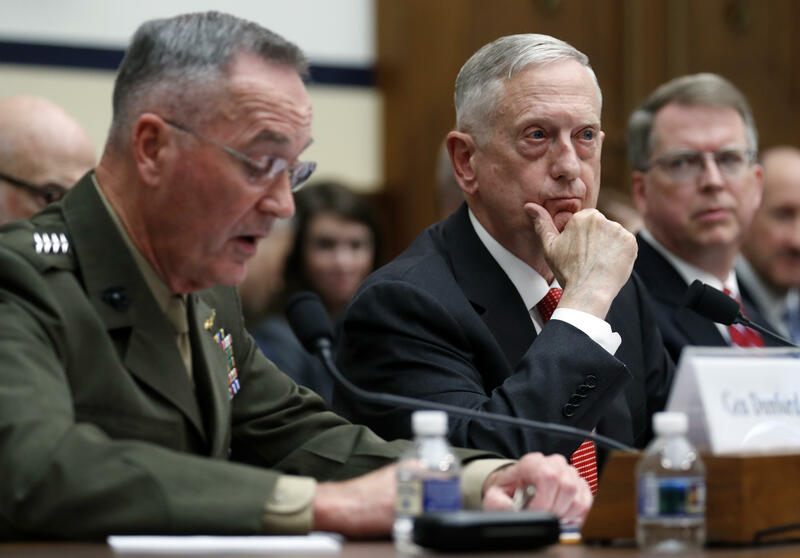 Mattis appeared before the committee along with Marine Corps Gen. Joseph Dunford, the chairman of the Joint Chiefs of Staff, to field questions from lawmakers on President Trump's proposed military budget for the 2018 fiscal year, which begins Oct. 1. Trump requested $639 billion for the Pentagon, including $65 billion for ongoing military operations. Yet Republican lawmakers are pressing for upward of $30 billion more to be added to the budget. They argue the extra money is needed to rebuild the military. "We have spent six years just getting by, asking more and more of those who serve, and putting off the choices that have to be made," said Rep. Mac Thornberry, R-Texas, the committee chairman. During the wide-ranging hearing, Mattis sought congressional approval to shutter excess military bases -- a move the Pentagon concludes will save billions of dollars but one that lawmakers have previously rejected. Mattis proposed a new round of base closings starting in 2021. He said the department "currently has more infrastructure capacity than required for operations." That outlook won't change even if the service branches grow in size, he said. Closing the unneeded bases would save $10 billion over a five-year period, Mattis said, which could be used to acquire four nuclear submarines or dozens of jet fighters. The GOP-led Congress rebuffed the Obama administration's requests to reduce the number of military bases. The Army and Air Force said they had vastly more space for training and basing troops than they need and trimming the surplus would generate savings that could be used to strengthen the military. But lawmakers have refused to go along, questioning the data and the analysis the Pentagon used to make its argument for fewer facilities. Military installations are prized possessions in congressional districts. Mattis sidestepped a question from Rep. Adam Smith, D-Wash., about an apparent disconnect on Qatar between Trump and Rex Tillerson, his secretary of state. Last week, Saudi Arabia, Egypt, the United Arab Emirates and Bahrain severed ties with Qatar amid a slew of punitive measures. Trump's condemnation of Qatar contradicted the message delivered by Tillerson, who had urged Qatar's neighbors to ease their blockade while calling for "calm and thoughtful dialogue." Qatar is a "very complex situation," Mattis said, as he stressed the need to find "common ground." Qatar has been engulfed in a political crisis that stems from accusations by its Arab neighbors that it supports terrorism. Qatar has denied the allegations, but its ties with Iran and embrace of various Islamist groups have brought intense scrutiny and made it a regional outlier. Trump sided with Qatar's antagonists, calling on the Gulf state to stop "the funding of terrorism." But Qatar has long been a U.S. ally. The country hosts roughly 10,000 American troops as well as the forward headquarters of U.S. Central Command. Mattis said Monday he expects to soon submit recommendations to Trump on how to move forward in Afghanistan. The top commander there has told lawmakers he could use several thousand more U.S. troops to end the stalemate in the country. The war in Afghanistan began in October 2001. The U.S. has about 9,800 troops there conducting counterterrorism operations against insurgents and training the Afghan army. Although they ended their combat mission against the Taliban in 2014, they are increasingly involved in backing up Afghan forces on the battlefield. Mattis also discussed the threat posed by North Korea. In his prepared statement, Mattis said, "The most urgent and dangerous threat to peace and security is North Korea," the statement read. "North Korea's continued pursuit of nuclear weapons and the means to deliver them has increased in pace and scope." During his testimony, Mattis said that the North Korean threat is growing, but current U.S. defenses are sufficient. Asked what war with the North would look like, the Defense secretary said that it would be a war like nothing we have seen since 1953, and the U.S. would have to deal with it with whatever force is necessary. Dunford told the panel that there would be casualties unlike any seen in 60 years. CBS News' Mary Walsh contributed to this report.